توسعه‌ فناوری رسانه، امکان پخش همزمان پیام‌های چندگانه را در قالب پیام‌های متنی و زیرمتنی در تلویزیون فراهم آورده است. پیام‌های‌ متنی، همان برنامه‌های متعارفی هستند که صفحه‏ نمایش را به خود اختصاص می‌دهند و پیام‌های نوشتاری زیرمتنی، در قالب نوار رونده در زیر صفحه نمایش از نظر می‌گذرند و به لحاظ موضوعی می‌توانند هماهنگ یا ناهماهنگ باشند. اصحاب رسانه مایل به استفاده بهینه از هر دو ظرفیت متنی و زیرمتنی هستند. با نظر به هدف‌های مخاطب، محدودیت پردازش اطلاعات در حافظه فعال و ملاحظات نظریه پردازش دوگانه، اینکه مغز پیام‌های همزمان را به گونه مؤثر مورد توجه و پردازش قرار دهد، محل سؤال است. پژوهش حاضر، حالات مخاطب را در دو موقعیت هدفمند / غیر‌هدفمند در تعامل با حالات هماهنگی / ناهماهنگی موضوعی این پیام‌ها مورد بررسی قرار داده و تأثیر آن را بر میزان یادآوری مطالعه کرده است. برای این منظور 150 شرکت‌کننده در قالب پنج گروه 30 نفری، با هدف‌های متفاوت، در معرض ترکیب مختلفی از پیام‌های متنی و زیرمتنی قرار گرفته‌اند. یافته‌ها نشان می‌دهد که دو عامل هدفمندی و هماهنگی می‌توانند در شرایطی، بر کانونی کردن پردازش و بیشینه کردن یادآوری پیام‌ها مؤثر باشند. assistant prof. in psychology of IRIB Uni. Development of media technology allows providing simultaneous playback of multiple messages in the forms of text and subtext messages on television. Textual Messages are the same conventional programs that accounted the screen, and sub textual messages viewed below the screen in the form of scrollable bar, and thematically can be coordinated or uncoordinated with each other. Media officials tend to make optimum use of both the text and subtext to their capacity. Regarding proposes of the audience, information processing limitations of active memory and dual process theory considerations, the brain's consideration and processing of the messages effectively at the same time is the question. Current study, investigates the respondent’s target states in two, determined/undetermined conditions with interaction to accordance/ discordance of the messages. In addition, has studied its influences on the anamnesis level. For this purpose, 150 participants in 30 groups of five people with different proposes have exposed to different combinations of text and subtext messages. Results indicate that two determined and consonance factors under some circumstances can be effective to focusing the process and maximize the anamnesis level of messages. بارون، بیرد و همکاران. (1394). روان‌شناسی اجتماعی(ترجمه یوسف کریمی). تهران. روان. کدیور، پروین. (1383). روان‏شناسی یادگیری. تهران: سمت. هومن، حیدر علی. (1385). استنباط آماری در پژوهش رفتاری. 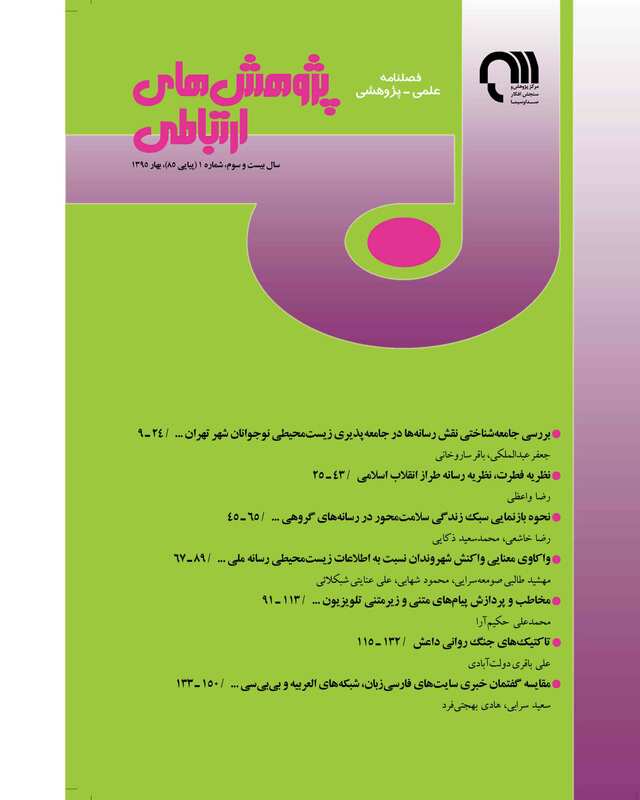 تهران: سمت. Apsler, R. & Sears, D. O. (1968). Warning, Personal Involvement, and Attitude Change. Journal of Personality and Social Psychology, Vol. 9, Pp.162 -166. Eagly, A. & Chaiken, S. (1993). The Psychology of Attitudes, Fort Worth, TX: Harcourt Brace Jovanovich. Evans, J. & Stanovich, E. (2013). Dual-Process Theories of Higher Cognition: Advancing The Debate. Perspectives on Psychological Science, Vol. 8, No.3, Pp. 223–241. Katz, E. ; Blumler, J. & Gurevitch, M. (1974). Uses of Mass Communication By The Individual. Mass Communication Research: Major Issues and Future Directions. Eds. W.P. Davidson and Fredrick Yu. New York: Praeger, Pp.11-35. Kruglanski, A. W. & Gigerenzer, G. )2011). Intuitive and Deliberate Judgements are Based on Common Principals. Psychological Review, 118, Pp. 97-109. Lasswell, H. W. (1927). Propaganda Techniques In The World War. New York: Peter Smith. Mcquail, D. (1997). Audience Analysis. Thousand Oaks, CA: Sage. Mcquail, D. (1979). Influence and Effects of Mass Media. In Mass Communication and Society, Edited By James Curran, Michael Gurevitch, and Janet Woolacott, Beverly Hills, Calif: Sage Publications. Petty, R. & Cacioppo, J. (1983). Central and Peripheral Routes To Persuation: Application To Advertising. In A. W. L. Percy, Advertising and Consumer Psychology (Pp. 3-23). Lexington: D. C. Health. Petty, R. ; Cacioppo, J. & Schumann, D. (1983). Central and Peripheral Routes to Advertising Effectiveness: The Moderating Role of Involvement. Journal of Consumer Research, Vol.10, Pp.135-146. Rubin, A. M. (2002). A Uses-and-Gratifications Perspective of Media Effects’. In J. Bryant & D. Zillmann (Eds), Media Effects: Advances In Theory and Research, Hillsdale, N J: Lawrence Erlbaum Associates, 2 Ed, Pp. 525-548. Schultz, D. E. & Kitchen, P. J. (2000). A Response To ‘Theoretical Concept Or Management Fashion?, 40:5 (September-October), Pp. 17-21. Sears, D. O. & Kosterman, R. (1994). Mass Media and Political Persuasion. In Brock & S. Shavutt (Eds), Persuasion: Psychlogical Insights and Perspectives. (Pp. 251-178). Needham Heights, MA: Allyn & Bacon. Sweller, J.; Ayres, P. & Kalyuga, S. (2011). Cognitive Load Theory. Springer, New York. Tewksbury, D. (1999). Differences In How We Watch The News: The Impact of Processing Goals And Expertise on Evaluations of Political Actors. Communication Research, Vol. 26, Pp. 4-29.